Shopping for a wedding dress can be an exciting (and occasionally stressful) time while you’re simultaneously planning a wedding. And if you’re trying to keep your bridal budget to a minimum, there’s no better way to do that than by buying your dress at a wedding dress sample sale. However, for an event where you and plenty of other brides to be will be on the hunt for the dress, you’re going to need some tips. Bridal sample sales can be exhilarating—finding a dress for a major deal? Yes, please. But they can also be intimidating. How can you navigate through the layers of lace and tulle when there are plenty of others going after the same dress? 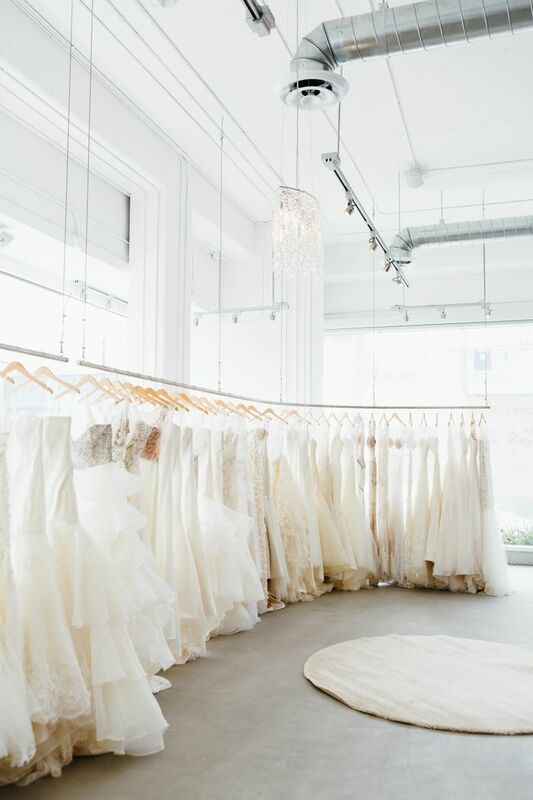 To get you prepare for the occasion, we asked Amber Rigney and Dawn Silva-Rigney of Kinsley James to give their best expert tips to know before you go to a sample sale for your gown. Once you have these, you’ll have the best experience and you’ll save some money too. See what they are now. “Sample sales are very different from normal dress appointments; this is for experienced shoppers looking to buy that day,” Dawn says. Make sure you check out the store’s website to get familiar with the designers and styles beforehand and be prepared to know what shape and style you are going for. According to Amber, they will not offer holds on these gowns, so being early for the sale is recommended in order to get the best options. James says that sample sales are fast moving. Most places only allow 40 minutes for each bride, so make sure you’re prepared to be extremely decisive on what you like and dislike. Only sample sale gowns will be on display, so the two bridal experts suggest making an appointment beforehand to try on all the gowns the brand carries. The bridal experts say, “This is the only chance you’ll have to get this type of a deal on a gown. Payments will need to be made in full at time of purchase, and then the dress will be yours.” Check what forms of payment are accepted by the store before going in, as oftentimes checks are not valid. Now check out our favorite bridal gowns on the market to get an idea of what you’ll be looking for at that upcoming sample sale. 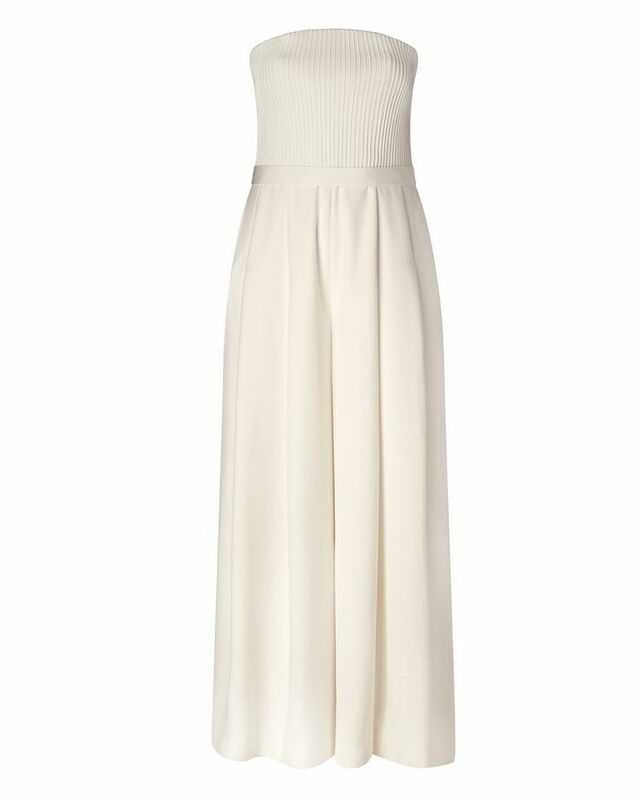 A jumpsuit for the unconventional bride. We certainly can’t complain about this price. This dress is too pretty. This will look so good as you walk down the aisle. You deserve to feel like royalty on your wedding day. Available in sizes 0 to 22. Available in sizes FR 34 to FR 44. Feathers are big in bridal wear this season. If you love texture, this dress is for you. Monique Lhuillier always has the most breathtaking bridal gowns. If you don’t want to wear a traditional white gown, try a pink blush take instead. Available in sizes UK 4 to UK 16. There’s nothing quite as classic as an Oscar de la Renta gown. Wait until you see the back detail. We love these romantic ruffles. This is not your average wedding dress. The draping of this fabric is everything. Available in sizes 16 to 24. For the bride who loves lace. Whether you choose to get your dress from a wedding dress sample sale or prefer to have a more personalized experience with an appointment, these tips will help you get one step closer to finding the dress that was made for you.